To kick things off is the first of many German players to feature in the list (see the stats section later). Riedle enjoyed spells with Werder Bremen, Lazio, Borussia Dortmund and Liverpool before finishing his illustrious career at Fulham in 2001. Not someone that would jump out as a big game player to fans of the Premier League, the Germany International popped up with some notable goals in his career. The most memorable being his brace in the final of the 1997 Champions League. Playing for Borussia Dortmund against holders Juventus, complete with new signing Zidane behind Vieri and Boksic (a frontline so good that Del Piero was only on the bench), Riedle put Dortmund 2-0 up after just 34 minutes. Del Piero got one back before Lars Ricken’s classy lob sealed the win for the German team to give Rielde and new Aston Villa manager, Paul Lambert, winners medals. His other big game goals came in the Semi Final of Euro ’92, when his brace was once again the difference as Germany beat hosts Sweden 3-2, which was enough to see him share the golden boot with three strikes overall, though they would lose famously to Denmark in the final. He also scored in the 1989 German Cup Final for Werder Bremen in a 4-1 defeat against future club Dortmund. Sadly for Riedle, he’s not even the highest ranked Karl Heinz on the list. Not an out and out striker, he was once described as the Dutch Duncan Edwards due to his versatility and quality. He eventually settled as a number 10 and certainly delivered on the big stage. 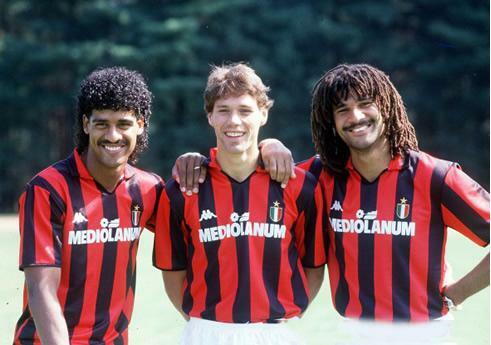 The former PSV Eindhoven and Chelsea star is best remembered for his time in Italy with AC Milan where he linked up with fellow Dutchmen Rijkaard and van Basten. And it’s with Milan that he scored a brace in a 4-0 thumping of Hagi’s Steaua Bucharest in the the European Cup Final of 1989, after scoring in the Semi Final demolition of Real Madrid (5-0). However, the goal he’s most famous for, and on perhaps his biggest stage was in the Final of Euro 88 with that iconic header (before an even more iconic volley by his strike partner). The fact that such a great footballing nation has only won one title (I’m not talking about England), makes this goal even more important. The dreadlocks also made it look a lot cooler. Not quite the household name as Gullit (unless you lived in the Hubresch house), the tall West Germany Centre Forward was known for his aerial prowess, and it was with his head that he scored two of his biggest goals, winning the Euro 1980 final with a 2-1 win over Belgium. The second goal was in the 88th minute, to win the whole tournament for the Germans. The surprising thing is that he’d never been capped before 1980, not that nerves seemed to have affected him. Just a few months earlier, he also scored two semi final goals in the European Cup as Hamburg made the final against Brian Clough’s Nottingham Forest, only to get injured on the way to defeat. Described as The Monster, the big frontman also showed his big game temperament with the winning penalty in the 1982 World Cup Semi Final with France, a game famous for Harald Schumacher’s assisination attempt on Patrick Battiston. The first current player to feature on the list, El Nino hasn’t had a good time of it since his £50m move to Chelsea in January 2011, but the green shoots of recovery started to show near the end of the 2011-12 season. Torres’ big game goals have a neat symmetry to them, scoring a Champions League Semi Final goal for Liverpool in 2008, followed that summer by a goal in the European Championships Final. Four long years passed without any other big game goals, including a miserable 2010 World Cup, but a change in fortune came in the Second Leg of the 2011-12 Champions League Semi-Final away at Barcelona. Ten man Chelsea were under immense pressure from the European Champions, with the score level on aggregate at 2-2 but Chelsea ahead on away goals. This was a big game, and this was big pressure – then came the moment of redemption, after Torres lost the ball on the left wing, he found himself out of position, just in time for a clearance to fall at his feet with half the pitch and no opponent between him and Victor Valdes. If he’d missed then you would have feared for his future and mental stability, but Torres went round the Barca keeper to confirm Chelsea’s progression to the final, and give Gary Neville a man crush. Just a few short months later, he became the first player to score in consecutive European Championships Finals, as Spain brushed Italy aside 4-0. That made it three tournaments in a row for the Spanish national team, but only possible with Torres’ winner in the 2008 Final against Germany. Moving on neatly from the man that revived Spain’s fortunes to a man that had a big hand in their first International title. Amancio Amaro had the bad luck to join Real Madrid in 1962, just after they’d won five consecutive European Cups. He had to wait until the 1965-66 season before the club won ‘their trophy’ again, scoring the equaliser in the final against Partizan Belgrade in a 2-1 win for the Madrid giants. Three semi final goals in the same competition cement his inclusion, and for his country, it was the extra time winner in the 1964 European Nations Cup (effectively Euro ’64) that proved the most decisive. Playing against Hungary, Amancio struck in the 113th minute to give Spain a 2-1 lead and put them in the final. An essential part of Benfica’s golden era alongside Eusebio, Águas scored in both the finals of the 1961 European Cup and the following year’s tournament. A prolific scorer ( 290 goals in 281 games for the Lisbon club), he won the golden boot in Portugal on five occasions. The first big game goal that he scored was in the first leg of the 1961 European Cup Semi-Final, in a 3-0 win over Rapid Vienna. He repeated the trick again in the second leg, this time ending in a 1-1 draw. In the final, Benfica would face the mighty Barcelona, who were hungrily looking for their first European Cup (they’d have to wait a while longer). Containing the legendary Hungarian trio Kubala, Kocsis and Czibor, the Catalan’s went 1-0 up, only for Águas to show his big game mettle once more and equalise, and take his tally to 11 for the tournament – wining him the golden boot. Benfica went on to win that game 3-2 to win their first European Cup. And the following year he was at it again. He scored Benfica’s goal in a 2-1 defeat to Danny Blanchflower’s Tottenham to put Benfica through to the final on aggregate (4-3), where they’d face another Spanish giant – this time it was Real Madrid, and they wanted their trophy back. Despite a hat trick by Ferenc Puskas, Benfica won 5-3 with Águas once again scoring his team’s first goal. The following year Benfica reached the final for a third successive time, but without an injured Águas, they would lose to AC Milan. In what appears to be a tribute to Iberian footballers, the next up is another Spanish striker. Similar to Amancio in terms of unlucky timings, Santillana (Carlos Alonso Gonzalez) played for Real Madrid for 17 seasons, only to miss out on the European Cup. Not that he’ll be too worried after 9 league titles, two UEFA Cups and four Copa del reys. It was in the UEFA Cup Finals that he scored two of his biggest goals, with the second in a 3-0 Final win over Hungary’s Videoton (me neither) in 1985, followed a year later with the final goal in a 5-1 lesson for FC Cologne. Of course his lack of European Cup medals wasn’t for the want of trying, with Santillana scoring in two semi final goals in 1980, one the following year, and then again just before retirement in 1987. It wasn’t to be for the talented front man (8th in the all time Spanish league goalscoring list), but it wasn’t a bad career to be fair. The first entry from the legendary 1970 team was arguably their most important player. One of only three players in history to score in every game in a World Cup, Jairzinho stood out, even in the team considered by many to be the greatest of all time – certainly the most entertaining. And it’s from the 1970 World Cup that he scored two of his biggest goals, firstly in the Semi Final against Uruguay, and then he scored the 3rd for Brazil in the final against Italy. Whilst he hero worshipped Garrincha (whom he replaced for Brazil), he wasn’t short of his own confidence, claiming that FIFA had awarded him the ‘Best Body on the Planet’ prize – an award that doesn’t exist, at least not in FIFA (as seen here). I’m not sure whether or not he was a comedy genius or very arrogant but no one can deny he was one of the best of all time. His other major goal came in the 1974 World Cup Final Group stages – a winner against bitter rivals Argentina no less. He wasn’t much of a coach, getting sacked by Gabon in his only Managerial role, he did however make up for this by spotting a 14 year old Brazilian lad by the name of Ronaldo, recommending him to his old club Cruzeiro. Antonio Wilson Vieira Honorio (better known as Coutinho) is the football equivalent of Buzz Aldrin. Sure, a lot of people know his name, but a lot more don’t and should do. Because Countinho’s Neil Armstrong was a fella by the name of Pele. Coutinho was voted Santos’ best ever player – if you exclude Pele. He scored over 370 goals for the team, and was one of the most important players in their team during their golden era of the early 60s. And few had more impact on the team. Of the two Copa Libertadores titles they won in 1962 and 1963, Coutinho scored a whopping five final goals (two in 62/three in 63). It’s a slightly misleading stat as there were three finals in 1962 and two in 1963, but he was certainly a big game player. Just to put it into context, Pele scored three goals in the same five games. One for the fans of 90′s Football Italia programme next. 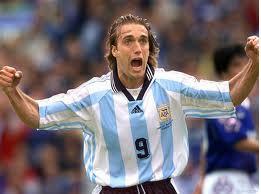 Gabriel ‘Batigol’ Batistuta was arguably the most complete centre forward of his era. Comfortable on either foot and handy in the air, he had a cannon of a shot on him. He spent the best years of his career with unfashionable Fiorentina, who somehow kept him for ten years, resulting in him not playing in the biggest European club games. One of the very few modern era footballers to play for both River Plate and hated rivals Boca Juniors (in that order), his biggest goals came in the blue and white of Argentina. Although he was a regular scorer in World Cups, he never scored in the last two rounds (he was at least the first player to score a hat trick at two World Cups). As a result, his big game scorer entries are all down to Copa America goals. In 1991, the tournament was decided by a final group table instead of a knock out round. Batistuta’s Argentina beat Colombia and Brazil along with a draw against Chile. Batistuta scored the winner against Brazil in a 3-2 victory, and the winner in a 2-1 win over Colombia – a goal that both won the tournament for Argentina, and the golden boot for the talented striker. Skip forward two years and it was Batigol that scored the decisive goals again to win the title for his country, with a brace against Mexico in a 2-1 win. Those aside, he also scored in both legs of the 1996 Coppa Italia Final to bring glory and silverware to Florence. They repaid him with a statue.